We will remember among the beautiful stories of this Moroccan weekend, those of two siblings that were under the spotlights, but not necessarily in the order that was expected. It all started yesterday with Khasan KHALMURZAEV (RUS), who finished the tournament with the third place. Yet this bronze medal was the least we could expect from a champion of the calibre of the Russian who was crowned Olympic Champion less than two years ago in Rio. Reaching the top level is a long way, coming back after the celebration period following an Olympic title can be even more difficult. This is what Khasan is currently trying to do, and we can only congratulate him to try and especially to be able to be on an international podium again. Today it was the turn of his twin brother, Khusen, to line up in the upper category (-90). Athlete number four in the competition, he was obviously a favourite but not THE favorite. Yet the magnificent gold medal he won today, supported by Khasan from the stands, is the sign that he will have to count on him in the months to come. A story of brothers who motivate each other and manage to perform is good. But when in the same tournament and in the same day, a fairly similar story is repeated, we are close to the exceptional. 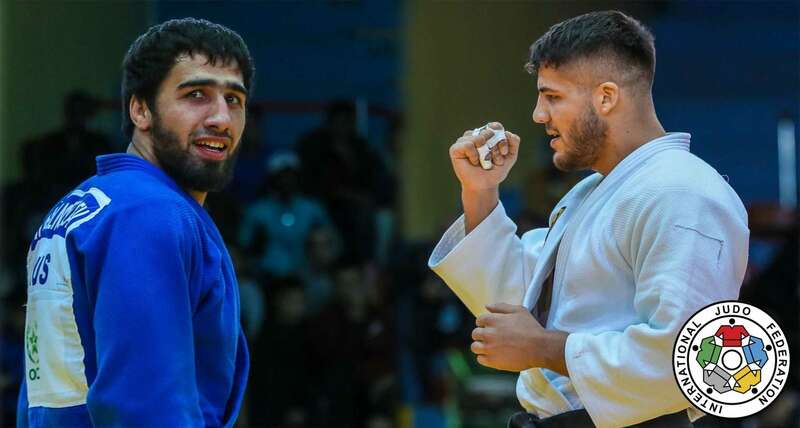 Nevertheless this is what happened in Agadir on the occasion of the third day of the Grand Prix, as Karl-Richard and Johannes FREY (GER) competed, for the first in -100kg and for the second in heavyweight. Once again, the most anticipated was Karl-Richard, since the 26-year-old already has a fifth-place Olympic position and two world medals, one bronze in Chelyabinsk 2014 and the other a silver in Astana 2015. On the occasion of this second world championship, he had actually defeated the future Olympic Champion of the category, Lukas KRPALEK (CZE) before losing in the final against the Japanese HAGA Ryunosuke. Undeniably, it was therefore Karl-Richard who had the best chance of a medal in the morning of this third Moroccan day. But finally it was his five-year-younger brother, who created the sensation by winning masterfully in the category of + 100kg, while Karl-Richard had to be satisfied, so to speak, with the bronze medal of -100kg only. The parallel between the KHALMURZAEV and FREY siblings, beyond the anecdotal dimension, is interesting, because throughout the tournament, this particular atmosphere that exists between members of the same family was palpable and the least we can say is that it has been successful. Despite the fact that he did not succeed to collect a new medal, it is always a pleasure to see Alexander MIKHAYLIN (RUS) in the tatami. On the women's side, the victory went to another German, Maike ZIECH (GER), while the latter was not at all the favourite of the day. But she managed to win by showing an impressive lack of fear, especially in the final when she was much smaller than her experienced opponent. In the +78kg, however, it is the favorite, Yelyzaveta KALANINA (UKR), who dominated the category, head and shoulders, as she was much taller than all her opponents. On the men's side, in addition to the magnificent result of Khusen KHALMURZAEV (RUS) who did not give a chance to Ciril GROSSKLAUS (SUI) who reached for the first time of his career a Grand Prix final, we should note the excellent performance of veteran Kirill DENISOV (RUS). At thirty, the prize list of the Russian champion is impressive; a five-time world medalist, three-time World Masters medalist and 19-time medalist on the international circuit, he still does not seem to have had enough of the elite. Against Jorge FONSECA (POR) whose explosive capacity scares many athletes, he did not wait too long to win with no discussion. Today was not a good day for Russian legend Alexander MIKHAYLIN (triple world champion and Olympic medalist), who is also still on the hunt for medals, when he was already world champion in 2001, seventeen years ago. But who today in Morocco, he failed at the foot of the podium after having been defeated by Johannes FREY in the semifinals. In the final medal standings, Slovenia, which had been leading the race for two days, was left behind by Russia, three titles against two, although the overall result of the Slovenian athletes in this Moroccan campaign remains very significant. Turkey and Germany are in ambush with two titles as well, while five countries win a title: Ukraine, Kazakhstan, Switzerland, Israel and Morocco. This gold medal, to which must be added a bronze medal and many athletes in the top 7, put Morocco in ninth place, which is a very good sign for the development of judo in Morocco, on the one hand, but also in Africa in a more global way. Countries like Japan or Brazil were not present and this opened the game for other nations, it is also what made the Agadir Grand Prix very interesting. The President of the Royal Moroccan Judo Federation, Chafik ELKETTANI, could be satisfied: "Our mission is fulfilled. That of our athletes first of all who have been valiant throughout the weekend. That of the organisation on the other hand because we had a nice Grand Prix. We owe this to all judo enthusiasts in Morocco. We are joining forces with the International Judo Federation as part of a global development plan. This Grand Prix was the first in a series of three, since we will meet again in Morocco in 2019 and 2020, and for these next two editions, the points will count for the Olympic qualifications. Everyone did a remarkable job that I want to emphasise. We learn, but with such an event, we learn fast and we can be proud."